Firstly, may I apologise most sincerely for the delay in replying? I can only offer the feeblest of excuses which aren't really worth mentioning. I regret to say that my recollection of specific machine details is a bit hairy-fairy these days but if you will forgive me for any mistakes. I will try to fill in some of the past history of the Crooks-Suzuki TR250's and the T500. 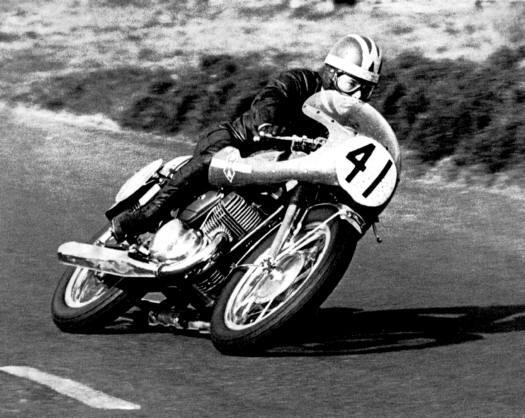 As far as I can recall, my first TR 250 was 100022 and was one of a batch of three that were entered by Suzuki G.B.for the TT in 1967. I can't remember who actually rode them but I can remember that they left the Island without a great deal of success. I was riding a one of Eddies T20's in the Production Race (4th place) but I do recall Rex White asking me to rebuild one of the TR cranks during practice week that brought round to the garage. After the TT the machines were sold (or lent) to Eddie, Bill Bancroft and another dealer whose name escapes me at the moment. We got #22 back to the workshop andI quickly and excitedly set about trying to sort out the unreliability problem that had plagued these machines over on the Island. The potential was very clear to see but the question was, could it be made to last the distance? The main trouble appeared to be piston and piston ring failure. The pistons were melting and the rings were breaking in the exhaust port. We were aware of a piston manufacturer in the U.S.A.called Wiseco and the fact that they had just brought out a piston that would be suitable for this engine and we quickly obtained a small batch of both STD and 0.25mm OS so that any wrecked barrel's could be reclaimed as spares were in very short supply -- in fact we had nothing. The piston melting problem was fairly easily brought under control by running the engine at a slightly reduced compression ratio and by very accurate control of mixture and the ignition timing - remember all that backlash in the Denso magneto drive coupling! Following some testing on our local airfield at Walney I entered the bike in the National Hill Climb at Barbon Manor and managed to take F.T.D. against machines up to 1000cc. setting a 250cc record that stood for almost10 years......not bad for the first time out! The next outing was the 250cc M.G.P. and after doing a couple of exploratory laps on the original T20 based racer I took '22 out on the evening session with the intention of doing a couple of laps as steadily and as carefully as possible. However, by the time I reached Ballacraine on my first circuit I had realised that the machine I was riding was unbelievably rapid. I was able to eat 7R's and 350 Manx's and must have had about 20mph.in hand over the run of the mill 250's. All good intentions now abandoned and with the red mist well and truly covering both windows I gave the rocket ship full wellie for two laps and returned to the pits having set the first 90+ lap on a 250 and chopped about a minute off the lap record for the class. I had also made the startling discovery that adrenaline was brown! Talk about exited. Sadly I only managed second place in the race due in no small part to the delayed start caused by foul weather and the fact that the race distance was reduced from four to three due to the rain and gales. I had never done a wet lap but was able to take the lead until I was forced to make a fuel stop because of my standard sized tank. The winner, Brian Ball, went straight through for the 3 laps. I was totally gutted and felt that I had been robbed. The bike, however, had performed flawlessly and that was at least some consolation. 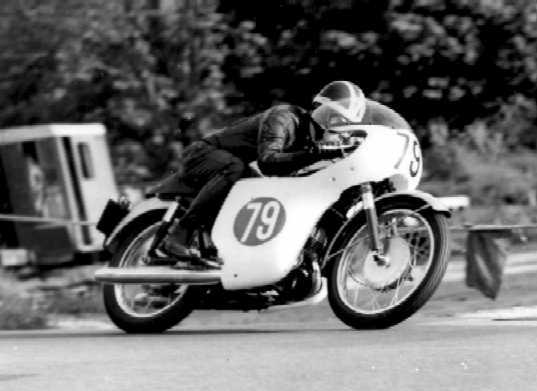 In 1968 Malcolm Uphill rode #29 in the Lightweight TT finishing in 4th (I think!) place winning the Motor Cycle Trophy for the best Non Factory entry and put a lap in at over 92mph. Shortly after the TT, Suzuki G.B imported a small batch of T R's and we obtained 7 or 8-- I can't be certain of the actual number-- and these were promptly sold to eager customers. Eddie kept one of these which was intended to be my race bike for the forthcoming M.G.P. with #22 as our training machine. During practice I rode both machines and the team was well pleased with the resulting lap times. However, when the race bike was taken out during the final session to run in the replacement tyres, chains and engine bits, I was horrified to discover that it felt down on power and did not pull the usual RPM figures at places such as the run towards Glen Vine and up the Mountain Mile. At a heated and very serious team meeting over dinner that evening I was offered the very difficult choice of which machine to weigh-in for the race. The immaculate and well-prepared race bike or the rapid but well used 'T' machine. I opted for the well worn but much quicker old '22 although I have to admit that I was far from confident with my choice. History proves that this was the correct decision and the Manx was won. 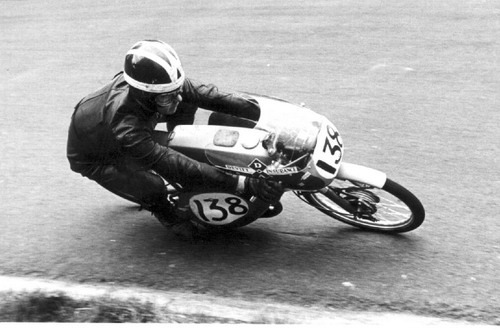 During the winter of 1968 Eddie obtained a third TR and we ran all three in '69 and '70 with various riders including Rex Butcher, Malcolm Uphill and Frank Perris. Rex did some of the British and few Continental meetings and Malcolm also rode in North-West and the Ulster GP. 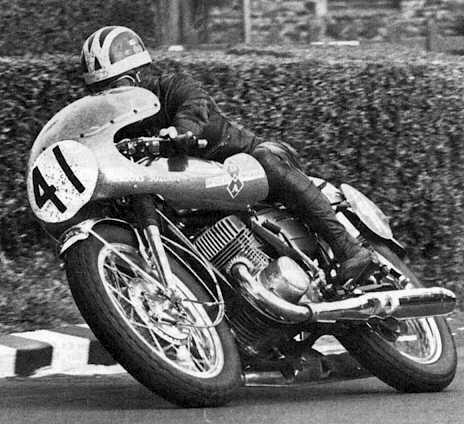 At the TT, Frank finished in second place behind Kel Carruthers on the Benelli 'four taking the Motor Cycle Trophy for the first private entry. 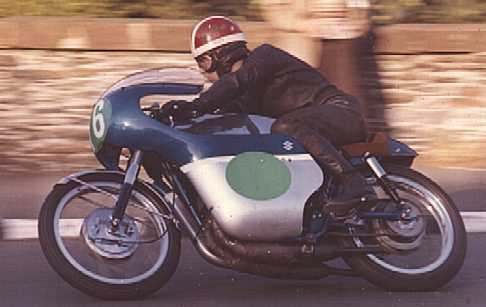 I finished 5th behind Santiago Herrero on the Ossa and Mike Chatterton on a Yamaha and was awarded the Ray.B.Westover Trophy for the best newcomer to the '69 TT. Sadly, Malcolm was forced out when the LH wheel adjuster broke allowing the wheel to move, loosening the chain. Unfortunately I have no accurate data available as to the specific machines ridden by everyone during this period although I would suspect that Eddie would be able to fill in some of this detail if he was suitably primed with a few large Whisky's. We decided to enter the 500 Production race in 1970 so a standard 1969/70 T500 was taken from stock, stripped, and rebuilt to PR spec. A very large alloy tank was commissioned by Jim Lee due to the race distance that year being 5 laps. All the usual race equipment was fitted and I added an 19'' rear rim to given a little extra ground clearance. Very little was done to the motor in the way of tuning for higher speed and in fact it retained the standard air-box and filter element as testing proved this to be the best set-up and the most reliable. Before the TT in June, the firm entered a number of bikes in the annual Thruxton 500 Mile race which we had won the previous year. My co-pilot was Stan Woods. In practice, the Crank broke and I spent all night on a rebuild in the back of the Transit van! Must have been OK 'cos we managed another class win and only missed the overall win by 1 lap - Malcolm Uphill and Percy Tait on the works 750 Truimph being the overall winners. The TT was really quite uneventful. I held back a little during practice rather than let everyone know how quick the T500 really was. In the race I passed Bill Smith on the exit from Quarter Bridge and never saw another bike for the 5 laps, winning the race at a cruise by over a minute. By far my easiest IoM ride and also my last as I then decided to pack in racing although I did do a few other races with the bike to finish off the season with some reasonable start money for a change I hope my rambling reminiscences have not been too boring and that you have found some useful and interesting details in them. As I said earlier, I apologise for any mistakes and errors of memory but after more than twentyfive years, recollections of events get a bit hazy. As you may or may not know, Martin Crooks has a Web site - http://www.crooks-suzuki.com/crooks.html and there is a fair bit in there about the organisation. I will also do my best to dig out some further details and pic's of this wonderful racing machine and let you have the in due course. It is not widely known that in 1968 Suzuki GB took two teams to Monza in order to try to establish a number of endurance World Records around the old and notorious banked oval. The 1968 250cc Production T20 was bored out to 252cc in order to move it into the 350cc class and Eddie Crooks, Brian Ball, George Anscheit and I successfully established a 24hr S/S World record which still stands to this day at 145.688 Km/Hr. 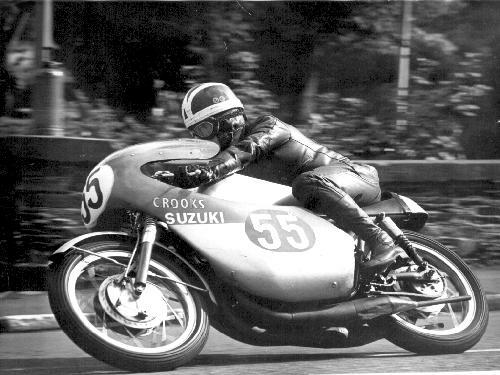 In 1969 Suzuki GB let me have the use of one of the very rare and, up till then, relatively unsuccessful TR50 Racers to campaign the British Championship for 50cc machines. During the following two seasons I thrashed this tiny bike unmercifully and either won or finished 2nd in every race except the '69 Ulster Grand Prix were I finished in 3rd place behind Angel Nieto and Van-de-Vries. Sadly I only manage the runner-up prize in the 1969 British Championship behind George Ashton's Garelli. The following year, after a season-long battle with Arthur Lawn on his Honda, I was delighted to add an ACU Gold Star to my Trophy chest by winning the last 50cc British Championship. I might add that during both seasons this wonderful little bike needed only 4 sets of piston rings and 2 small-end needle bearings - making this the most reliable and successful racing machine I have ever ridden. I have been reading your T500 Suzuki fanatics/Crooks Suzuki page with extreme interest. I purchased the T500 Production Racer that Frank Whiteway won the 1970 Isle of Man Production TT on belonging to Eddie Crooks and raced it in the I.O.M. between 1971 and 1977 in every I.O.M T.T Production 500 / International Senior 500 / Formula 1 /Formula 750 / Classic 1000 and Jubilee 1000 race. A total of 20 T.T. Races. Including practice consistently winning Silver and Bronze replicas Somewhere in the region of 337 laps over 13, 000 racing miles around the Isle of man, that was apart from the dozens of other races each year including Thruxton 500 mile endurance races. The 5th place in the production race was after having a two minute penalty at the massed start for failing to start the machine by mechanical means and having to wait two minutes after everyone had gone before I was allowed a push start, then lying a lonely last on the roads for the first three laps. On the last lap going down to Greg N Ba I caught and passed four riders in one go, Danny Shimmin. Martin Ashwood. P Jones all Suzuki's and Bill Milne on a Kawasaki Mach 3. At the line it was Martin and myself side by side and we were both credited with a time of 85.54 mph I was just a wheel in front and beat him by 4/5ths of a second which went to prove just how quick this machine really was for a road bike. 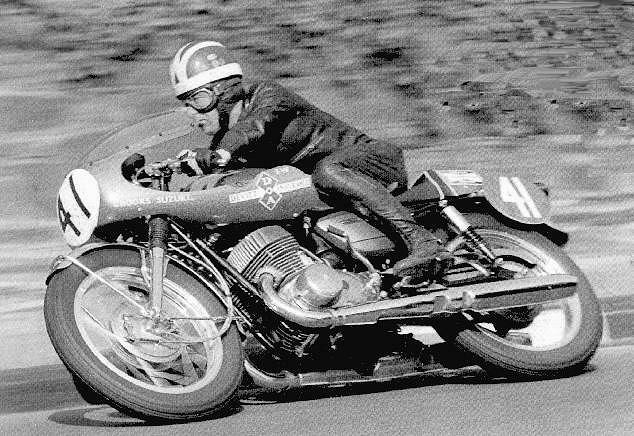 In the early years the machine was consistently faster than many pukka 500 racing machines G50s and Manx Nortons and a lot of 750 Norton's BSA's Triumphs and even Suzuki GS100s. The machine was always the fastest 500 production machine through the Highlander speed trap at around 145 to 150mph. and set a new lap record in 1975, 95-45mph, Frank had won the 1970 race at 89mph and the fastest lap in 1976, I was credited by the press with a NEW LAP RECORD BUT IN FACT IT WAS IAN RICHARDS WHO ACHIEVED THAT these were in the ten lap/two rider production machine T.T.s when I had Ian Richards as my partner. The only drawback with the machine was it's weight and handling left much to be desired and after six laps of the island it left you with aching limbs, but then the machine was never designed to do 150mph, and a bit quicker than that when Frank Whiteway rode it to his T.T. win. I am convinced that if you could have got it not to consistently shake it's front end all over the place on the flat out high speed sections, lap times of well over 100mph good have been achieved. 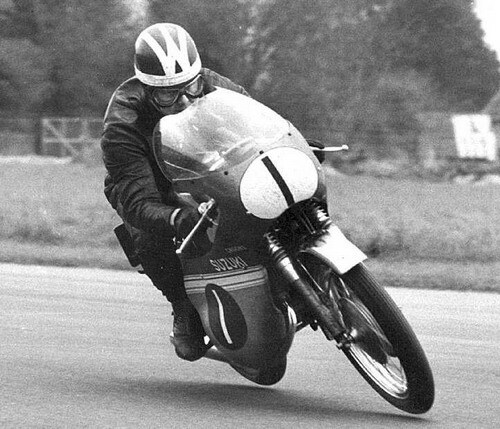 In 1972 in the Oulton Park Easter Monday International 500 race the bike was quicker than, and I beat the works Heron Suzuki TR500 which Stan Woods rode. Rex White the team Manager was mortified. I had done a lot of extensive development work on the engine with the help of George Ratcliffe Development engineer at Villiers who had had prepared Peter Inchleys works Starmakers. later the main thing that increased lap times was having a front brake by fitting homologated Dunstall twin discs. before that doing six laps of the T.T was positively dangerous. On several occasions I arrived at Signpost with no front brake whatsoever, having cooked it at Creg and Brandish and flying straight on down the slip road to Onchan.